With the days of summer vacation coming to an end in the coming weeks for most kids here in Florida, now is the time to head to the beach or make that last trip to the theme parks before school resumes. In Iowa, where I’m from, it is the last days to go out on the river… the Mississippi River. Now compared to the ocean, the Mississippi is surely not as graceful (the murky, muddy water is sure to turn off many not used to it), but it lends locals a place to cool off and enjoy the heat much like Floridians do in the ocean. Despite the rather disgusting appearance of the Mississippi, it has caused several desserts to be named in its likeness. I’m sure some of you are now wondering how I can call the Mississippi River rather disgusting in appearance and then turn around and state there are desserts named after it. Surely those desserts must not be very appetizing. Well in fact they are extremely delicious and the name can be rather deceiving. The reason desserts, like this one, take on the name Mississippi Mud, is a result of the dense, gooey texture of the confection, which is similar to the texture the silt has that settles in the Mississippi River Delta. The silt is what gives the Mississippi its notorious muddy, murky water. Now that you understand these brownie bites won’t taste like murky mud and are probably more interested in making them we can talk a bit more about them. 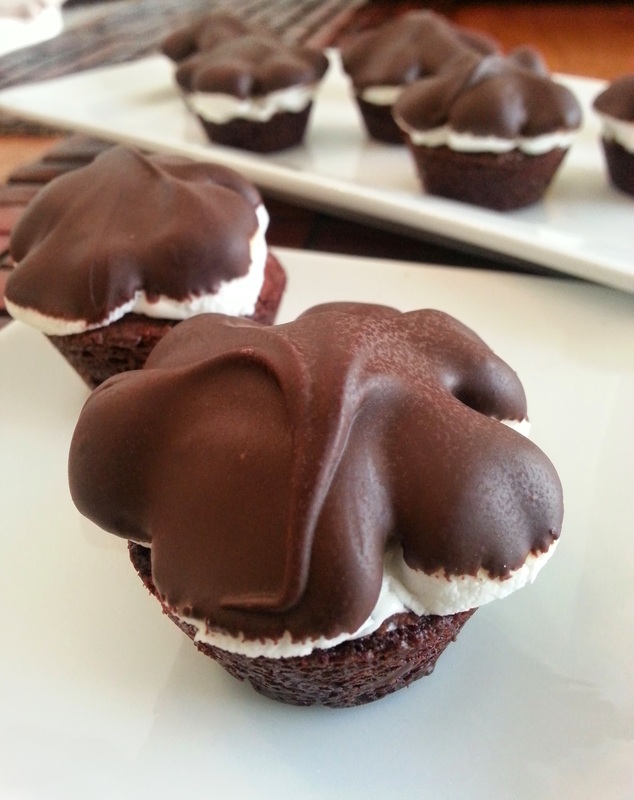 These little brownies are moist, fudgy bites topped with melted marshmallows. They are extremely simple to prepare and the only thing you must be sure not to do is overbake them. They are supposed to be moist and fudgy so when you initially pull them out of the oven they may still appear to be under-baked but they will continue to cook in the pan and when you melt the marshmallows under the broiler. If you are pressed for time you can always use a box brownie mix but I prefer to make them from scratch because they come out with a better texture. This recipe makes about 24 mini brownie bites. 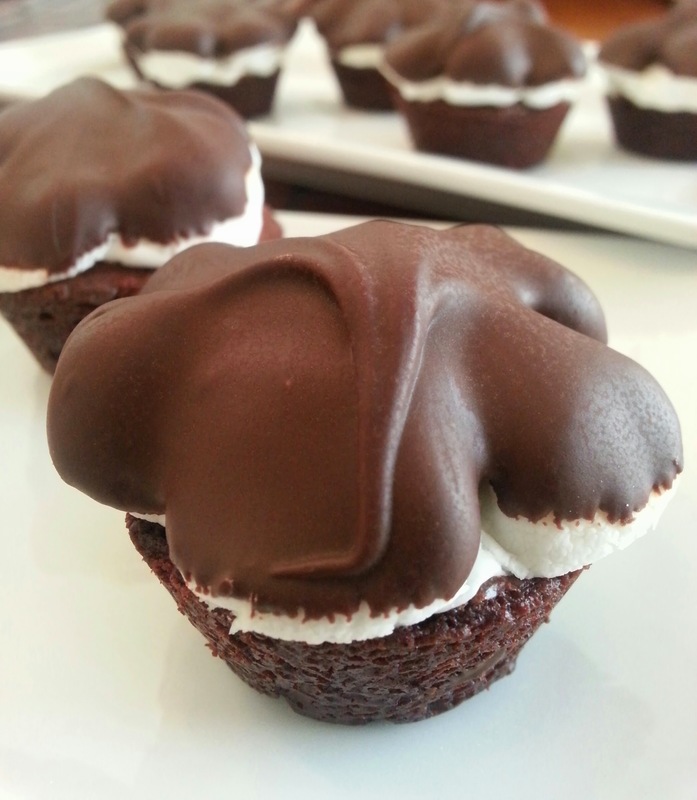 You can make a larger, brownie cup version by filling standard muffin cups instead of using a mini muffin pan, however, keep in mind the yield will be a lot less. Brownies can be stored in an airtight container at room temperature for about 2 days. Adjust oven rack to the middle position and heat to 325°. Melt chocolate and butter in a large heatproof bowl placed over a medium saucepan filled with about ½ inch of barely simmering water. Do not let the bowl touch the water. Stir occasionally, until mixture is smooth, about 5 to 7 minutes; cool slightly. Combine the flour, cocoa powder, and salt in a bowl. In a separate bowl, whisk sugar and eggs together. Add the melted chocolate mixture, whisking until incorporated. Stir the flour mixture into the chocolate mixture until no streaks of flour remain. Fold in the walnuts. Fill each cup of the muffin tin evenly with batter, about halfway full. Bake until toothpick inserted in center comes out with a few wet crumbs attached, about 15-20 minutes. Remove from oven. Preheat broiler. 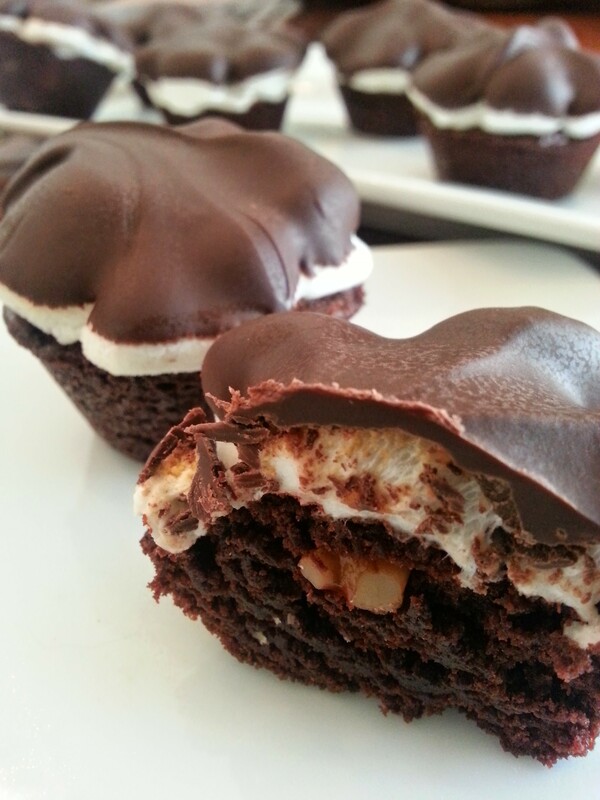 Arrange marshmallows on top of warm brownie bites, filling in all the space. Broil, keeping a close eye to make sure marshmallow does not burn, about 1 minute. Remove from oven and allow to cool in pan for 5 minutes before transferring to a wire rack to cool completely. For the topping, melt dipping chocolate by following directions on package. Take a brownie bite and dip the top in the chocolate, making sure not to dip to far so that some of the marshmallow remains exposed. Repeat with all the bites. 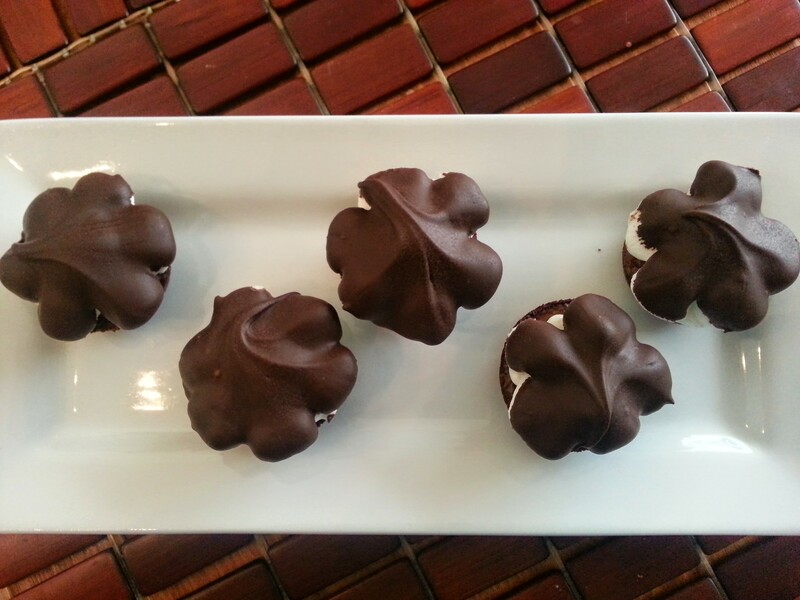 If the chocolate begins to get too stiff, microwave for 30 seconds to loosen. Wow ! This looks amazing !